Thread: Textures & Weathering, not as hard as you think! Hey, I like shiny as much as the next guy. But I like rusted & busted, too. 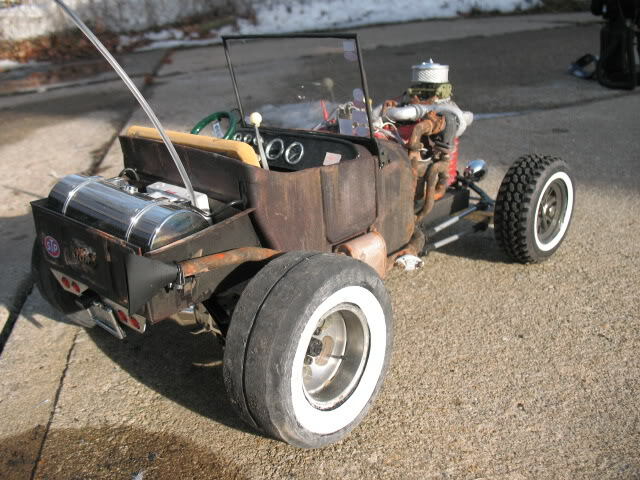 And if you're building a rat rod, shiny ain't gonna cut it. The same technique I use for rust also works very well for adding surface texture to smooth parts. Cast iron and carpet look pretty similar when you get down to it. Your brain fills in the logical gaps based on context; a seat looks fluffy and a manifold looks hard even though they have exactly the same texture under the paint. Lay on a nice wet coat , get out the Microballoons, and pour it on while the paint is wet. Then paint again, a light coat this time. And we've got a nice cast-iron manifold. For nice fluffy seats, don't re-paint after adding the Microballoons. The Microballoons are microscopic glass beads, so they'll pick up whatever color is underneath. 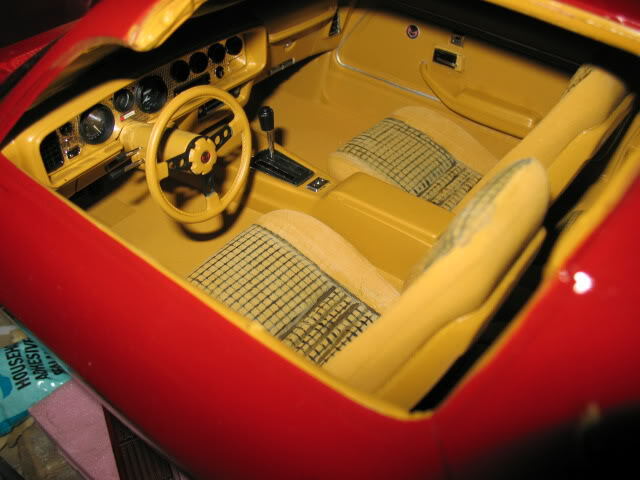 Notice the "cloth" seats and "hard plastic" cover on the seat back; they were painted the same color, from the same can. 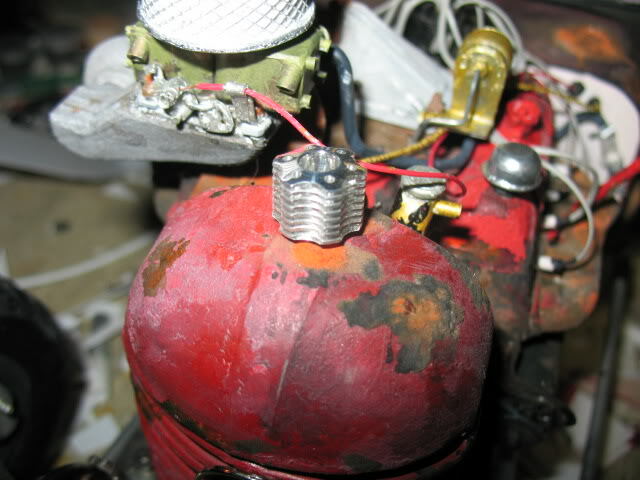 Weathering is a whole nother can of worms, but still uses Microballoons, mostly where you want heavy rust. 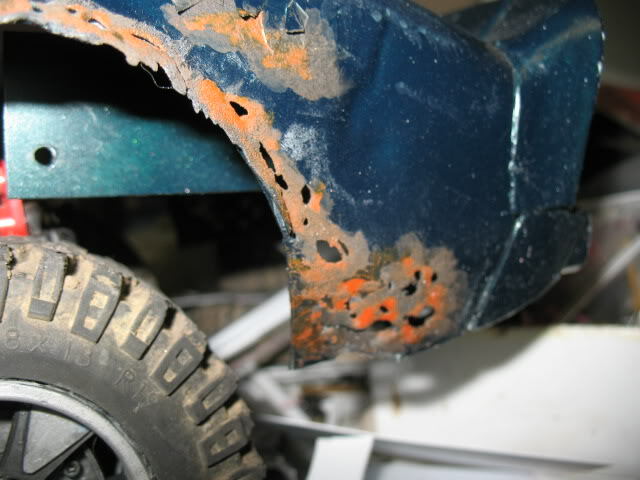 The RaTbucket has a very rough surface texture. I used flat black from a spray can, first a heavy coat to get the color, then a mist coat, held far away, to throw a little surface on it. You'll have to experiment to get a technique; you don't want to take painting advice from me as my technique is terrible. I hold the paint too close to the surface and move it too fast, but I get decent results because I've been doing it that way for 40 years. There's also a very weak dark-gray wash applied. This makes the flat black look old. It doesn't get much nastier than this. Make the actual holes from the back with a Dremel sanding drum. 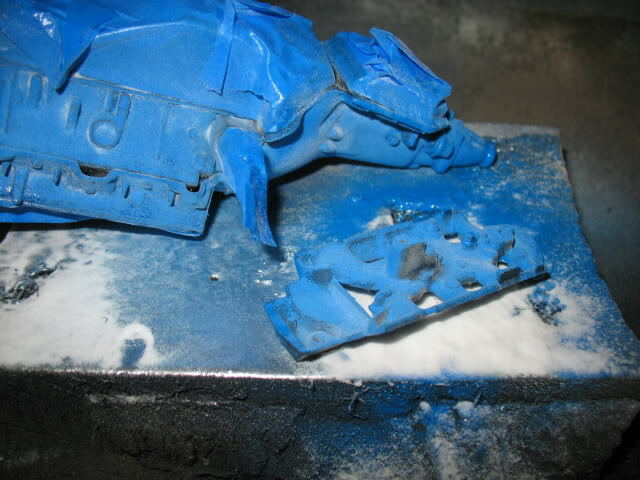 If you're working with styrene , let it cool off every few seconds as you want to grind the plastic rather than melt it. Paint around the holes with red-brown and pour some Microballoons on while it's still wet. Then add flat red, flat black and flat orange. Don't let the paint dry between colors; you want them to bleed together. At the top of the photo you'll see some "peeling paint" which is actually .005 styrene . 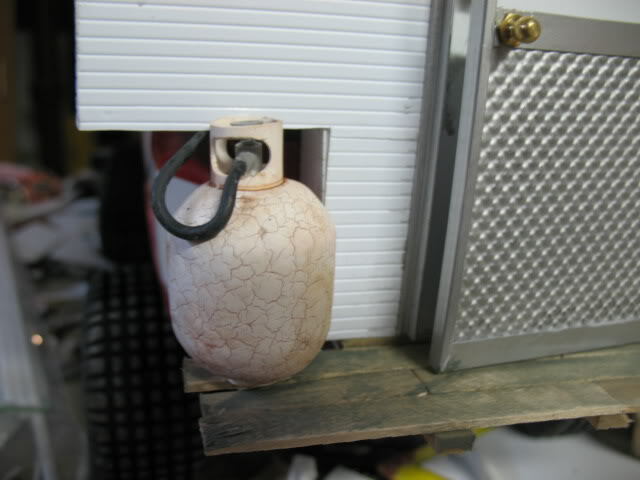 This eggshell effect is achieved by painting over not-quite-cured epoxy . Unpredictable. There's a lot of texture/weathering going on here. And all of it is necessary. It seems our first "encounter" was on the blog from Hemmings Motor News, but you did not explain why you found me! Don, many thanks for your explanation about another way to replicate the coating. This is effectively something I will try. If I wrote that I'm not too comfortable with the air brush is the fact that rat cans paint have the right consistency, no cleaning even after just one small "pfutt" which is a non-sense to do with an airbrush . As you stated, it must be cleaned after each usage, no matter if you are using it for 3 hours or 5 seconds. I did all the leather painting with the airbrush and had no trouble with it, but I would not do the outside body with it. 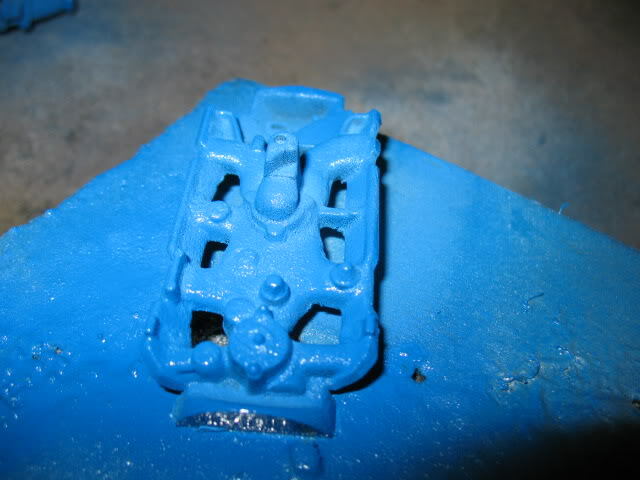 I noticed that if the paint is too thick, nothing is coming out, therefore to get the desire undercoating effect, some experimentation is needed. You are right, if the effect is too coarse, it's not looking "right". 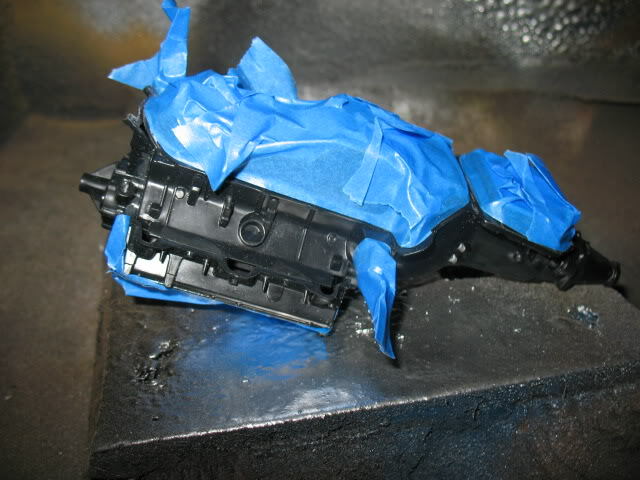 Not all cars have an undercoating. Some have just the wheel wells, some have in addition to that some undercoating sprayed near the rocker panels; I think that the whole factory coated underbody is unique to the Mark II. Some cars have the wheel wells painted body color; is there a coating under the paint? I just don't know and I don't remember how were protected (or lack of that) the Opels leaving the Swiss assembly line. A shame, because I was there! Old partly used containers of paint can give a finish like what you describe, when applied with a brush. If you have a really old can or bottle, it may be worth a try on some scrap metal. This is an old topic, but this afternoon I tried the flour method. It's no good: when the paint is still wet, the flour should be spayed on the surface because by pouring the flour, it absorbs the paint most immediately and too much flour is staying. I tried to spray the floor; the only result was a dirty airbrush ! The microbaloons seems more promising. personally, I would be reluctant to try something not synthetic, but an adventurous soul might give "corn meal" a go in the larger scales. would look awkward in 1:35 or 1:24-5 to my eyes.